Who would have thought that Europe is actually closer to Boston than places like Seattle and Los Angeles. It's true, the flight from Boston to Reykjavik is a mere four and a half hours long. 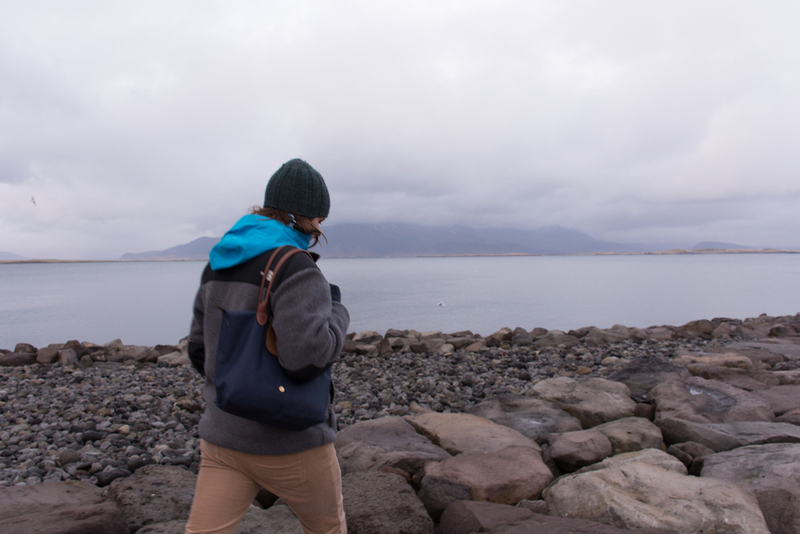 Iceland has long been on mine and Larisa's travel bucket list, and we decided it was a perfect getaway for the fall. October is a good time to go, because the crowds have already died down, but the weather is still manageably warm and dry, with a good balance of day and night, there's plenty of opportunities for sightseeing and northern lights. We arrived in Reykjavik around 6 in the morning, and after getting breakfast at the "oldest" diner in Reykjavik, we decided to spend the first day on the Golden Circle, since it was likely going to be the only day without rain and the Golden Circle had much to offer. The Golden Circle loops roughly 300 km from Reykjavik eastwards and back. Much driving in Iceland looks something like this. Could be Montana? Sure, but as soon as you get out of the car, you start seeing the stark differences from Montana. As seen in the photo, the speed limit is 90, that's the case on most highways. 90 km/h is only 55 mph, slow by U.S. highway standards. So driving from one point to another usually takes longer than it might seem. 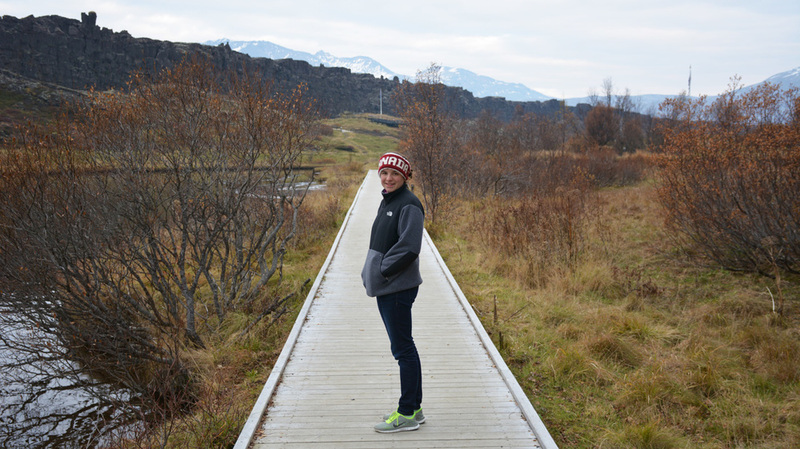 The first stop on our Golden Circle tour was Þingvellir (Thingvellir) National Park. The park lies on the largest lake in Iceland, as well as a large exposed section of the mid-Atlantic ridge, in fact it is one of the few places in the world where the boundary between the North American and Eurasian plates can be seen with the naked eye. There's a few extra letters, like Ðð (second version of the regular Dd), Ææ, and Þþ. Some letters are missing, like C, Q, W, and Z. Strange eh? Icelandic is perhaps one of the hardest languages to pronounce too. Advice? Don't try too hard with the locals, chances are you might get laughed at. Back to the Thingvellir National Park. It was a very chilly day with temperatures hovering around 7 degrees Celsius throughout the day, the air was moist and heavy, though very refreshing and clean. We walked around the park, looked (and climbed) the walls of the continents, and crossed from North America to Europe by foot. Thingvellir National Park is not only a stunning natural landmark, it's most importantly the site of the first democratic parliament in history founded in 930 and is still active to this day, though in Reykjavik. The park is enormous, though the main tourist area is fairly small and is easily accessible by walkways. Interestingly, tectonic plate boundaries come in all shapes and types. Though most of the mid-Atlantic ridge is under the waters of the Atlantic, a small faction of it is on land in Iceland, and out of that, some of it is under fresh water. Some of the lower sections of the crack in the earth's crust are lower than the water table, so they fill up with pure, crystal-clean Icelandic water. Many tour operators offer snorkeling tours to these deep ponds, but we didn't join the party, October is a bit too cold for that. All in all, Thingvellir is a magical place, wide open spaces, rocks, mossy plains, pristine lakes, and rich history. 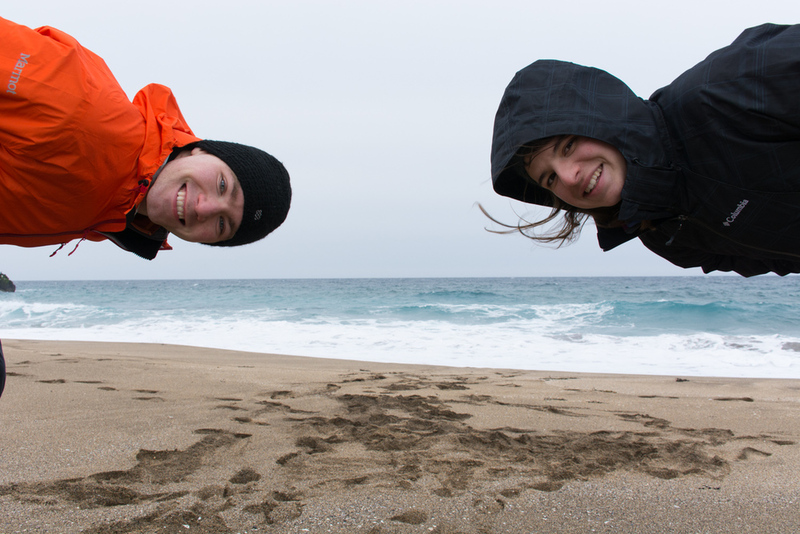 It's a perfect introduction to Icelandic nature and culture. With a location on the mid-Atlantic ridge, Iceland gets a very good share of tectonic activity in the shape of volcano eruptions, earthquakes, and geysers. I've been to Yellowstone, and while Iceland has a lot of geysers, they are a lot more spread out, creating a less impressive display overall, than Yosemite. That being said, it's still a beautiful sight. 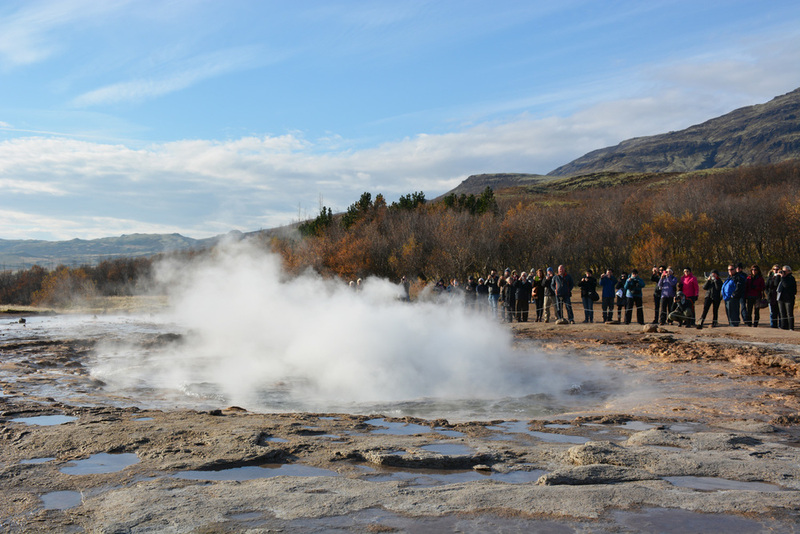 The main geyser area on the Golden Circle is a small area with a few hot springs and fumaroles and a couple geysers, mainly Geysir (which erupts sporadically every couple years), and Strokkur, which erupts every 8 minutes with an impressive precision. Waterfalls. That's one of the main things that Iceland's beauty is known for. The impressive display of millions of gallons of pristine water tumbling down rocky volcanic terrain. It's a magical sight. 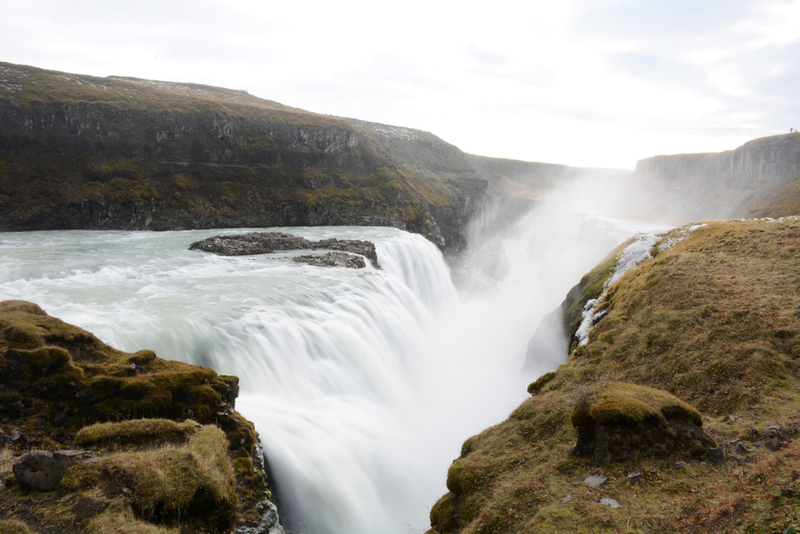 Our first waterfall of the trip is also one of the most popular destinations on the Golden Circle - Gullfoss. It stands at 32 meters high, with water tumbling down a narrow canyon, creating a dramatic impression that the water is disappearing into the earth. Because the only way to truly experience the view is by getting close to the fall, a lot of mist constantly fills the air, and while it's not a big deal during the warmer months of the year, it can be quite uncomfortable in the fall and winter. Dress warm. On the way from Gullfoss to Kerið (a sunken volcano), we got administered our first dose of "Icelandic wooly friend", as Larisa called them. I've seen sheep before in my life, but none were so soft and fluffy as these. The fact that they were free-roaming the green Icelandic fields made it into a truly remarkable sight. They were so happy, so at peace here. Domesticated, but wild at the same time. 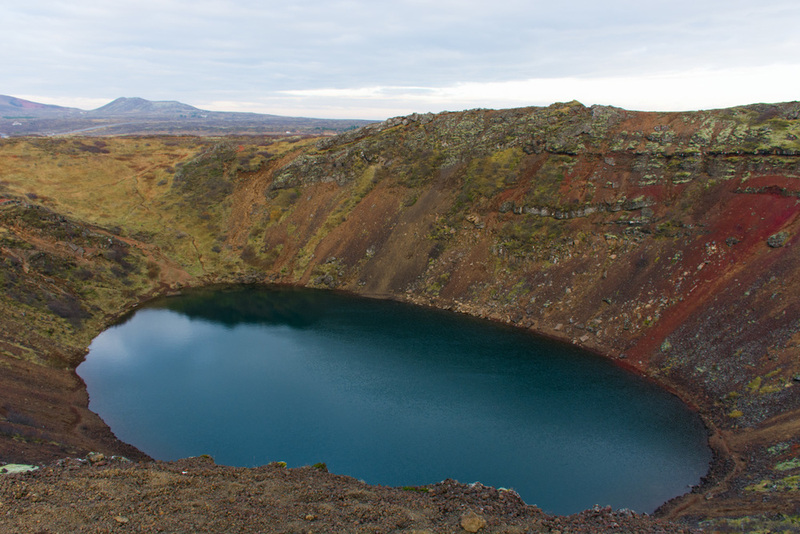 Shortly after visiting the wooly friends, we arrived at Kerið (Kerid), a volcanic crater formed roughly 3,000 years ago. 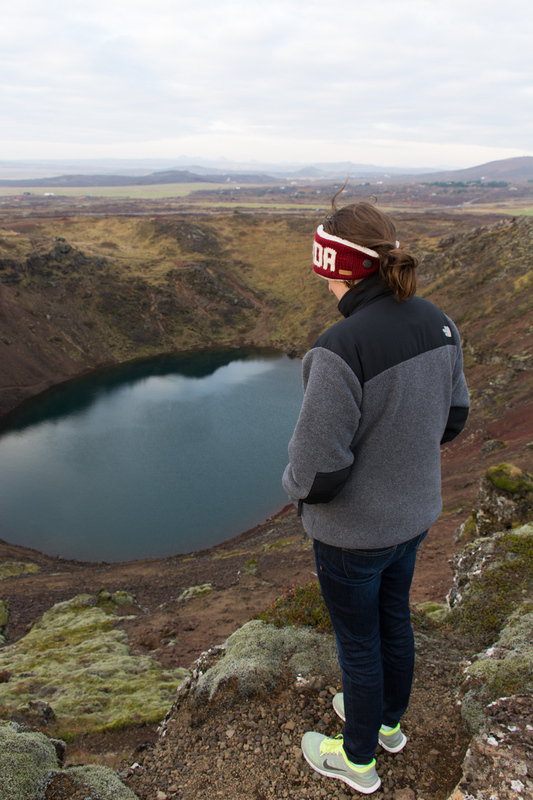 We were a bit taken off guard when we were charged $5 in USD or Euro (krona not accepted), to visit the crater, but scam or not, it was a worthwhile investment. The water level in the crater changes with the water table, when we were there it was abnormally high, a small bench on the side of the path was partially submerged underwater. What better way to start your second day in Iceland than with a delicious scandinavian breakfast. I've always been a yogurt fan, but Skyr, a national Icelandic staple food, is something else. It's a mixture of yogurt and kefir, not overly sweet, and you can have a lot of it without getting full. We stayed at Hotel Laxnes, just 15 minutes outside of Reykjavik, a clean family-owned hotel with nice amenities and unlimited breakfast. After breakfast, we headed out to Snæfellsnes peninsula to visit the Snæfellsnes National Park and attempt a hike to the Snæfellsjökull glacier. 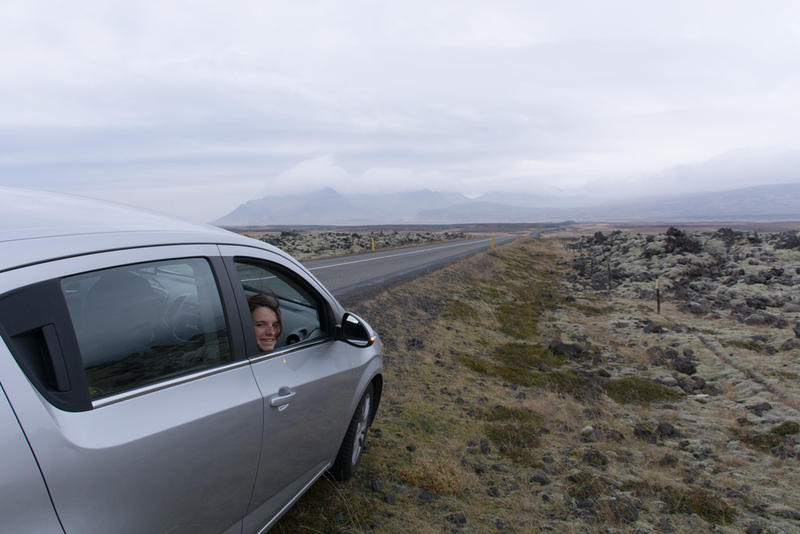 It takes a little over two hours to get to Snæfellsnes from Reykjavik, but the drive is a scenic one. Shortly after you leave the Reykjavik area, there's little but fields of mossy rock tundra as far as the eye can see, sporadically broken up by small horse and sheep pastures. Since car rentals are expensive in Iceland, just like any other European country, we rented a small Chevy Spark, a car I've rented many times before, and it worked out just fine for the two of us. Aside from the fact that the trunk door broke and we lost a significant amount of cargo space. Among many things, Iceland has a long history of horse-breeding. After driving through the Icelandic countryside, we soon started to notice that these beautiful animals are everywhere. There are thousands of them. The most impressive thing is that they're not confined to small pastures, they roam freely as far as the eye can see. These horses are mainly raised for recreational use within Iceland, as well as for export to other countries where they are used for and sport. Despite their often wild localities, they seem very well groomed and taken care of. When we came close to one of the horses, Larisa said, "look, his hair is prettier than mine!". They are beautiful. This particular pasture happened to be right on the boundary of the Snæfellsnes National Park, the majestic glacial backdrop made for some stunning photography. With all of our dilly dallying and coffee/bathroom stops, we arrived at the park around 2 in the afternoon. Not bad, one might think. Keeping in mind that it gets completely dark at 6 that time of the year, we didn't have much time to spare. With 3 hours, we decided to attempt to backpack towards the Snæfellsjökull and see how far we could get before the darkness caught up to us. Hiking in Iceland is different from any other place I've been to. There's really no concept of designated trails for the most part. Though the trail to the glacier was marked on our trail map, we hard a very hard time even finding the trailhead. Eventually, we parked our car on a small lot with no other cars, crossed the road and started up a so-called "trail". The first 50 meters or so were marked with trail posts and a distinct path was visible. The farther we went, the less visible the path became, eventually disintegrating fully in the mossy rocks. It was a blustery day, the wind was adding an unpleasant windchill to an already low 5-7 degrees. To top it off, I've temporarily lost my Patagonia down jacket which was my main piece of winter clothing to keep me warm through the night. But I was determined to camp in the wilderness, even if we weren't going to make it to the glacier. We've hiked for about 2 hours, and eventually Larisa and I agreed that the best thing to do was to pitch the tent, as going further wouldn't be possible because visibility was poor and we didn't have enough daylight to make it all the way up. The problem we didn't anticipate is that there was absolutely no water on the mountain. You'd think in the land of green moss and springs, there would be a stream of some kind - there were none. We've had some water with us, but rationing was key to make sure we had enough to make our hot meals and tea. The night was cold. We've zipped our sleeping bags together to keep each other warm, and even though they weren't the same lengths, it seemed to work out well. Except the fact that our tent was on an incline and we kept finding ourselves at one end of our tent every couple hours. We made dinner, and stayed up late playing cards in our sleeping bags. There was something special, laying in that tent, with the wind howling outside, playing cards under our headlamps. We were in Iceland. The morning welcomed us with nice weather, the anticipated rain didn't come, and while it was still cold and windy, we had dry gear to be thankful for. 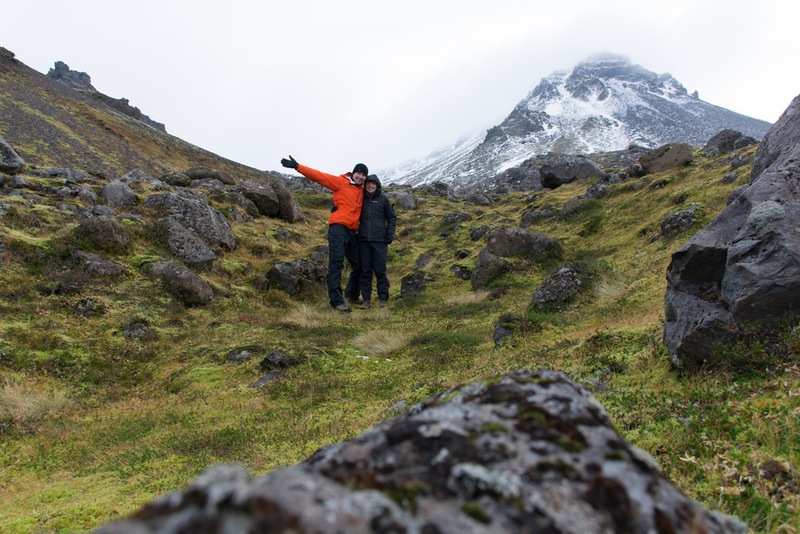 On the photo above, the Snæfellsjökull glacier lies right above the peak that's behind us. Since we didn't make it there by foot, we later decided to drive up to the glacier from the other side. The road there brought us virtually to the glacier. I've seen glaciers before, but every time it's a "whoa" kind of moment. They are all so different, spectacular, pure. The glacier was covered with crevasses, so walking further uphill wasn't wise without a guide and gear. 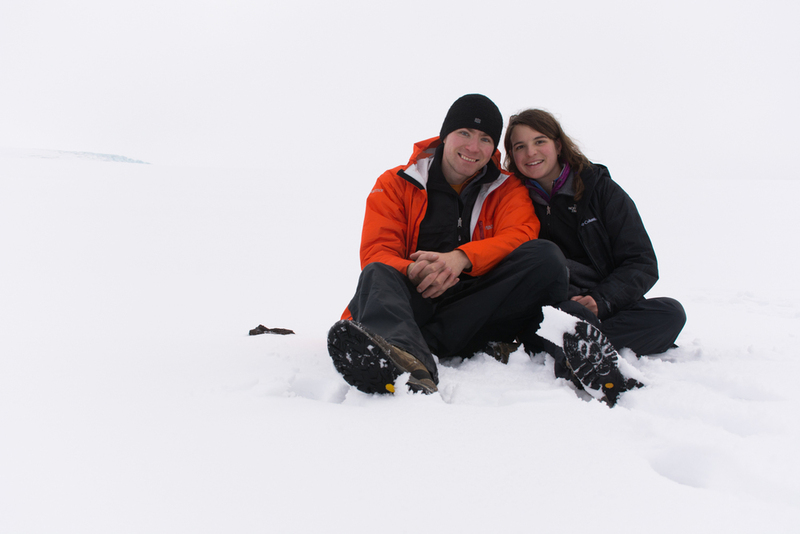 So we got to enjoy the snow and the views at the very base of the glacier. The park also offers a beautiful coastline, with rocky, volcanic rock beaches. The rest of the afternoon we spent exploring the coastline. One thing that really surprised me was the color of the water, it was the same North Atlantic that we have in the northeast, but the water was so much more blue, more translucent. Everything in Iceland is pure. This old lighthouse had a unapologetically modern color palette. 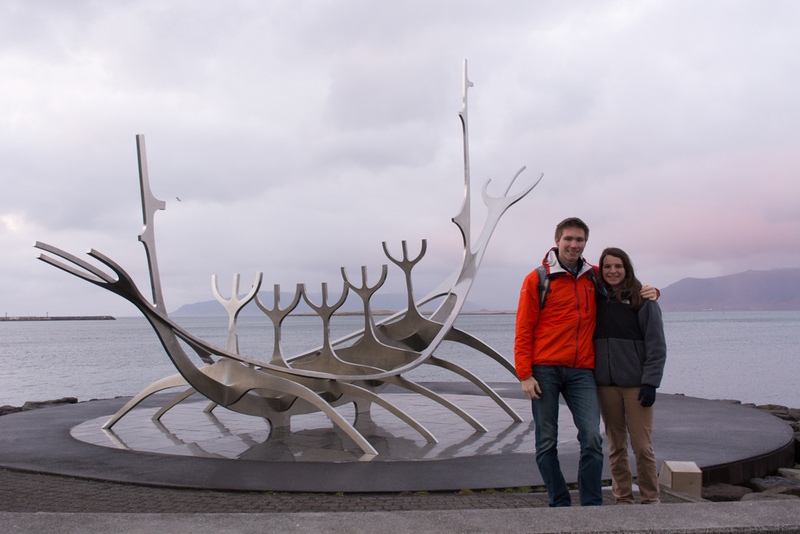 On our fourth day in Iceland, we had finally made our way to the heart of Reykjavik. We've briefly explored the downtown on the first morning when we arrived, but this time we came back for a bit more in-depth exploration of the charming town. The first and probably most notable attraction in Reykjavik is the Hallgrimskirkja - the largest church in Iceland. Commissined in 1937, standing at 73 meters high, it is the tallest building, and the 6th tallest structure in Iceland. Hallgrimskirkja stands right in the heart of Reykjavik, offering spectacular views of the downtown from a public viewing area accessible by elevator for 200 ISK per person. It's well worth it. The way one gets to experience Reykjavik from the top of the church is truly amazing. The bright colored houses and roofs create a colorful puzzle that looks like a miniature town. The intense color that we saw from the bird's eye view continues in the streets below. There's not an overwhelming amount of graffiti in Reykjavik, vandalism in Iceland is very uncommon, in fact, Iceland has one of the lowest crime rates in the world and Icelanders are often rated as one of the happiest people on earth. The kind of graffiti that is on the walls of some buildings is very artsy and good. More of a decoration than a nuisance. Even the fire hydrants are colorful. I think seeing this colorful hydrant with my beautiful girlfriend has sparked a desire to start a photo collection of fire hydrants from all over the world. Now it's on my to-photograph list when I travel. 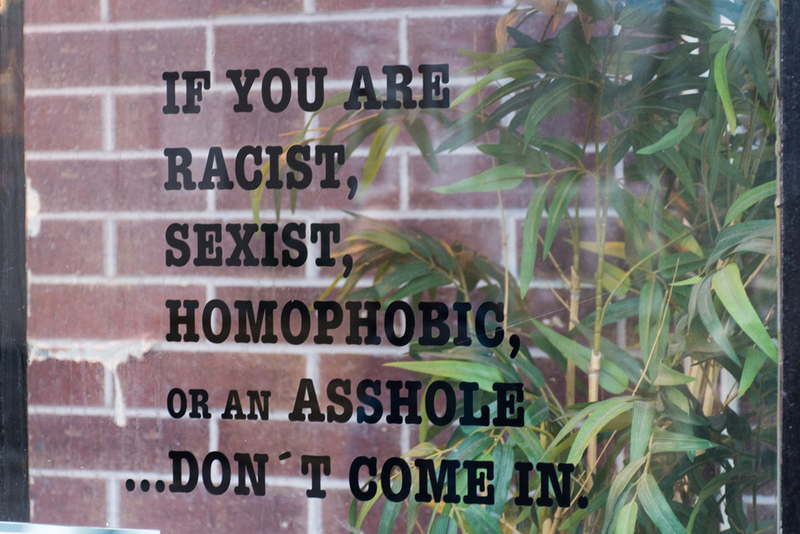 Iceland is a very progressive country with very low tolerance for any kind of discrimination. Laugavegur is the main shopping, dining and art street in Reykjavik, with many interesting stores to visit. One of them is an awesome year-round Christmas store which happened to accept letters to Icelandic Santa - for $20 a pop. Can we just kill commercialism already? When I was a kid, letters to Santa were free. When we were planning our trip to Iceland, Larisa learned that one of the best places to get locally crafted souvenirs, art and food was the weekly Kolaportið flea market. Given my love for authentic (not made in China) souvenirs, I was all for checking out the market. Aside from some local dried fish, and other non-tempting food, there was surprisingly little "local" merchandise at the market. It was cool to visit and see what it's all about, but definitely not a prime tourist destination. One of the newest and also coolest museums in Reykjavik is the 871 +/- 2 museum - an underground archeorogical excavation of what is one of the oldest structures in Iceland. Located several meters beneath the modern streets of Reykjavik, it exposes the reality of how many things changed in one thousand something years. Later in the afternoon the hunger started to creep in, and after eating "Icelandic hot dogs", which not surprisingly were just plain and boring hot dogs, we decided to head to Micro Bar, a highly-recommended beer bar with a very large selection of beers. Being in Iceland, I naturally wanted to try various local brews, and I was amazed to find just how many varieties were brewed right here, in Iceland, a country with a population of just over 300 thousand people - half of that of Boston. Of course now I don't remember which beer I had, but it was good. I wish the bar offered some authentic snacks, like smoked fish to go with the beer however. The main highlight of this shot, aside from my lovely girlfriend, is what highlights the extent of Icelandic military power. The coast guard. Though not prohibited like Japan or some other countries, Iceland voluntarily doesn't have a military aside from coast guard which primarily participates in rescue operations and fishing regulation to protect Icelandic fishermen from intrusion by other countries. The Solfar (Sun Voyager) statue is one of Reykjavik's landmarks. The statue is very modern in feel, yet the concept behind it is the representation of the origin of the Icelandic people - vikings arriving on ships from far away lands. 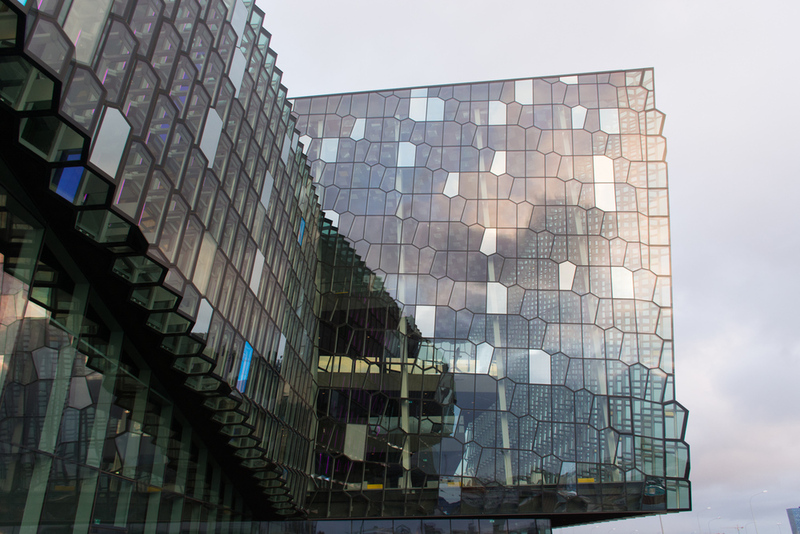 Another landmark located right by the water is the Harpa concert hall. The walls of this modern concert are made entirely of steel honeycomb-shaped structures with glass. Surprising for such a cold climate. The building is beautiful, the color of the glass seems to change and appear in slightly different colors depending on the time of day and weather. Unfortunately we didn't get a tour of the actual concert hall, but we wandered around and explored. As our stay in Iceland was coming to a close, we had planned to visit one additional landmark - Skogafoss, and just drive southeast of Reykjavik and consume the beautiful landscapes. First, however, we had to visit Álafoss one of the most popular wool companies in this little country. Considering that there are probably more sheep than people in Iceland, it's not too far fetched that Icelandic wool is well-known for its quality. Knitting has also been a family tradition in Iceland for generations, so the wool products sold in Iceland are absolutely great. Álafoss factory store happened to be located just a couple minutes from our hotel, so we stopped by. Larisa bought herself a sweater, a hat, and a beer mitten as a gift. I initially thought that $250 was a bit steep for a sweater but now I regret that I haven't bought one. Prices are what you'd expect at a fancy European clothing store. Hats, mittens, and other small accessories run in the 40-60 euro range, sweaters, vests and pullovers run over $200. After visiting the wool store, we headed on a day trip to southern Iceland, mainly to visit Skógafoss, perhaps one of the most photogenic waterfalls in Iceland. Though they're all photogenic. On the way there, I decided to stop on the side of the highway and just take a few shots. There was something so beautiful about this wide open landscape. The air smelled like manure because of numerous cow pastures not far off the highway. The road was long and straight. The mountains mysterious and green. Skógafoss is located on the Skóga river, which can be seen behind us on this photo. It's quiet here, tamed, but the falls above are everything but. As the story goes, there's a chest full of gold hidden behind the waterfall. Every attempt to retrieve it, however, has failed with some sort of mishap so no one has tried to retrieve it for many years. The beauty of this waterfall is more than enough. Standing in front of this majestical flow of water, surrounded by green fields, misty air and snow-capped mountains gave me a familiar feeling - one of renewal, cleansing, calmness. Skógafoss was the ultimate representation of the force of nature. There's a lot of moss in Iceland, it's everywhere, covering the land as far as the eye can see (unless it's winter and it's covered by snow). But in our several days in Iceland, no scene emphasized the beauty of moss as this one. Grassy, mossy fields covering a volcanic landscape. Almost looks like a place from Narnia. 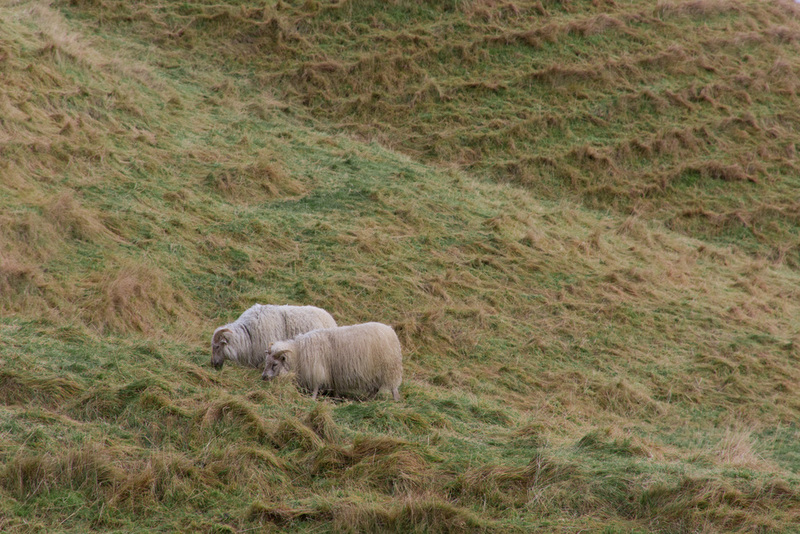 And just as we were exploring the Skógafoss area and hiking a mile or so up the famous Laugavegur trail, we came across our wooly friends. They're everywhere! On our way back to Reykjavik, we passed Hekla, a 1,400-something meter stratovolcano, one of the most active in Iceland. The high volcanic activity can be witnessed by wide swaths of lava and ash flows, many kilometers away from the volcano itself. The snow-called peak and the black river of lava create a very dramatic effect. Another waterfall on our way from Skógafoss. Not sure what the name of that one is, but it was very stunning even from far away. There's far too many waterfalls in Iceland to see in one weekend. And finally, as the sun was setting we arrived at the Blue Lagoon. Iceland's famous hot spring. The Blue Lagoon is not a natural spring area, but rather a coincidental byproduct of a nearby geothermal power plant. Speaking of geothermal power, 87% of all buildings in Iceland are heated with geothermal power - now that's renewable energy. Anyway, the water from the power plant is used to fill the artificial lagoon that's part of the Blue Lagoon spa complex. Its very fancy. We spent a few hours there, soaking in the lukewarm hot spring water, standing under a warm sulfur-infused waterfall, and relaxing in a lava-cave steam room. It was a nice experience, though I wish the water was warmer in the lagoon itself. As we were enjoying the hot springs, the sky was clear and full of stars, the first time we had clear weather all our stay. Larisa pointed to the sky and said - "I think that's northern lights". I looked toward the sky and saw something that looked like a contrail from an airplane. Later, the contrail got greener and wider, at that point, we both knew it, the auroral display was heating up. Others in the lagoon started pointing towards the sky. It was a truly wonderful experience, in a weird way it sent shivers down my body, just from seeing something so beautiful. As the night went on, the light show became more intense. The lights danced across the sky, the came and went, they stood still, they flowed. It was as if the lights were alive. All of a sudden, they would zoom across the sky and change shapes and colors. After visiting the Blue Lagoon, we parked on a dark road for half an hour to watch the lights. I set up my camera and started taking interval shots in hopes of getting some good shots as well as assembling a timelapse. It was worth it. We were both really captivated by this natural wonder. Larisa looked at the sky in wonder and screamed "look, look, look, right there, right there!!" as the light was suddenly changing from green to pink and orange. Northern lights may be a casual event for the locals, but people like Larisa and I, living in latitudes where lights are very rarely seen, it was a treat. I highly recommend visiting Iceland in a dark season just for that reason alone - aurora borealis. Just a capture of our hotel room right before we checked out. It was a nice, simple room, though overpriced by American standards. We paid roughly $130 a night, which would have easily gotten us a much nicer room in the States. On the last day we decided to go on a short hike before our flight. Mt. Esja trailhead was located just 10 minutes from Hotel Laxnes, and offered nice views of Reykjavik. It snowed overnight, so we were pleasantly surprised with some wintry scenery. 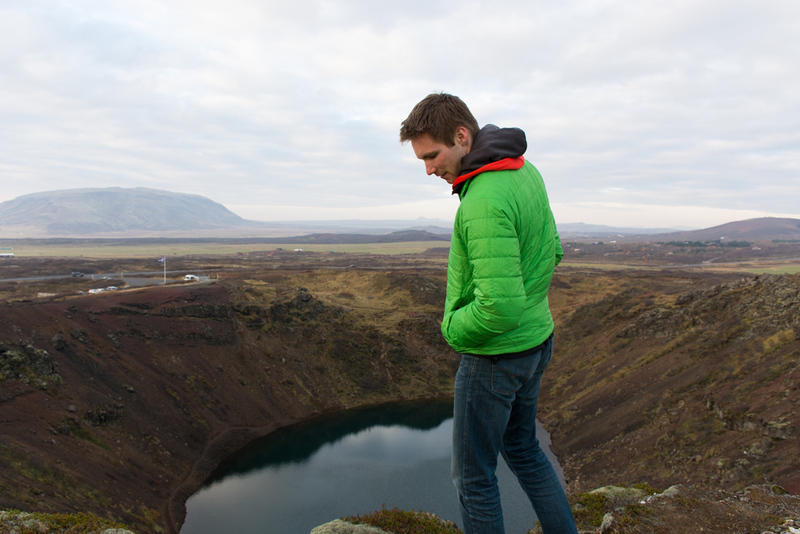 After our short hike, we drove to Reykjavik where I purchased a cod skin as a souvenir. It's not as nasty as it sounds, I promise. Icelanders have an enormous fishing industry and the fish skin is treated and used in fancy accessories like wallets and purses. Reykjavik airport is one of the nicest airports I have ever been to. Upon dropping our car off at the Sixt rental location, the agent offered to drive us to the terminal in our own rental car so we didn't have to take our bags out. Then, we quickly checked in and proceeded through customs and onto the gate area. We grabbed a bite to eat at an airport cafe, which turned out to be some of the best Icelandic food we've had our entire visit. A pretty nice marketing trick to get people to visit. Keflavik airport is a major connecting point for people traveling from North America into Europe so it's a convenient opportunity to market Iceland. And we finally take off for a brief 5 hour flight to Boston. It has been a magical time, and we hope to be back sometime in the summer to do more backpacking and exploring in nicer weather. Perhaps one of the most remarkable things about Iceland is it's nature. These pristine landscapes often don't seem like Earth, yet at the same time, they represent the best of Earth's wonders. Enjoy this short compilation of nature scenery we've been lucky to witness in our short stay in Iceland.